Helen: Jay, what's down there? Jay: I don't know. Something meaner than hell! Hot on the heels of Joe Dante's Gremlins comes this vaguely similar 1986 outing from Stephen Herek—director of the diametrically opposed Bill & Ted's Excellent Adventure and Mr. Holland's Opus—in which another group of small, bizarre, and very hungry creatures wreak havoc in a small town. This time it's a renegade batch of alien nasties known as Crites, who escape from some kind of prison asteroid in deep space, and crash-land on Earth, just outside rural Grovers Bend, Kansas. The ravenous Crites are about the size of a soccer ball, are 99% razor sharp teeth, have the ability to shoot poison darts out of their heads, and travel around by rolling themselves into a ball (which often prompts comically unavoidable visions of stagehands just off camera hurling furry balls whenever the Crites are supposed to be on the move). The main group of humans who have to stand up against the invading critters are the Brown family, led by dad Jay (Billy Green Bush) and mom Helen (Dee Wallace Stone), and their two kids, cute teen sis April (Nadine Van der Velde, who ironically went on to star in the very similar Munchies) and her troublemaking younger brother Bradley (Scott Grimes), who in true genre form becomes the de facto hero. The Brown's handyman, and Bradley's pal, is the town simpleton/drunk, a bike-riding kook named Charlie (Don Opper), who of course has trouble convincing the locals, as well as the sheriff (M. Emmet Walsh) that an actual alien invasion has begun. Luckily for them, a pair of Crite-hunting, shape-shifting bounty hunters with very big guns arrive, one of whom takes the form of rock star Johnny Steele (Terrence Mann), while the other is in a constant state of flux looking for the right identity to absorb. 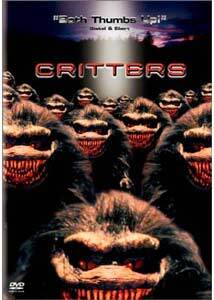 There is a wealth of Spielbergian nods in Critters, from a few sly E.T. references (including E.T. mom Dee Wallace Stone herself) to the swirling David Newman score that seems to have been constructed as a John Williams sound-alike, all of which makes Critters look and sound like it has more substance than it really does. The story, unfortunately, never really goes anywhere, and though there are a number of fun jump scares, there isn't much going on other than endless scenes of critters chasing the Brown family around their farmhouse. The special effects are negligible, and the Crites themselves never look like anything but overly stiff puppets, which in later sequels was at least improved upon somewhat. The entire Critters series (there were three sequels, all of which have been released by New Line) was built to have more humor than chills; one Crite even utters the "f" word (via subtitles) during one scene, and the beasties are certainly more silly than scary. This entry in the series has the benefit of a particularly strong cast of familiar faces (Wallace-Stone, Walsh, Green Bush), something a little out of the ordinary for most low-budget genre film, and the blatant stabs at copying the look and feel of Spielberg and his ilk does give Critters a bit more (bad pun alert) bite, even if the story never takes off as well as it could have. Image Transfer Review: New Line has done a solid job on the image transfer for Critters, offering a 1.85:1 anamorphic widescreen as well as a 1.33:1 fullframe transfer for those of you who don't like those weird black bars. While the black levels are a little murky at times, overall the transfer is pretty impressive, with bright, vivid colors and evenly-balanced fleshtones. Image details are crisp, with no major compression artifacts or blemishes to be found. Considering its low-budget roots, this one looks very nice, indeed. Audio Transfer Review: Audio is provided in both Dolby Digital 5.1 and 2.0 stereo surround mixes. The new beefed up 5.1 track offers up a surprising amount of sub rumble, and while rear channel cues are fairly minimal there are a few standout moments of chittering Crite mayhem where it is used to good effect, but not as often as it could have been employed. Dialogue is clean and presentable, but a little on the flat side, while the David Newman score swells appropriately with more depth than the voice track manages to muster. Extras Review: Other than theatrical trailers for all four Critters films, pop the disc in your DVD-ROM drive and you'll be rewarded with an alternate ending (04m:20s) that is slightly less upbeat than the original. The disc is cut into 20 chapters, and includes English subtitles. Not a completely awful film (it certainly could have been much worse), but the 1986-era puppet special effects diminish any real level of belief suspension. Director Stephen Herek does a fine job emulating a low-budget Spielberg, and instills enough levity to make things tolerable. New Line has released dressed up versions of all four Critters titles individually, but the big question is, why no boxed set?